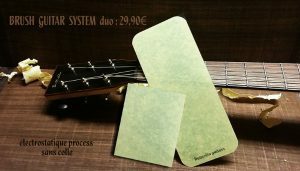 The ‘ Brush Guitar System ‘ (BGS) is a new accessory adapted to all acoustic guitarists. In the manner of Tommy Emmanuel, you can rub your hand on the BGS, bring out the equivalent of the sound of a drummer playing brooms on his snare, without damaging the varnish of your guitar. do not slip from the instrument once installed. leave no trace on the case of your guitar. can be used indefinitely, provided to put it back after use on its protective sheet. 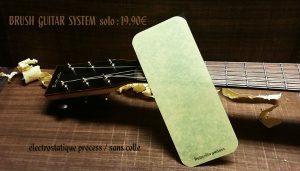 can be used in both acoustic and electro. does not disturb the quality of the instrument once installed.